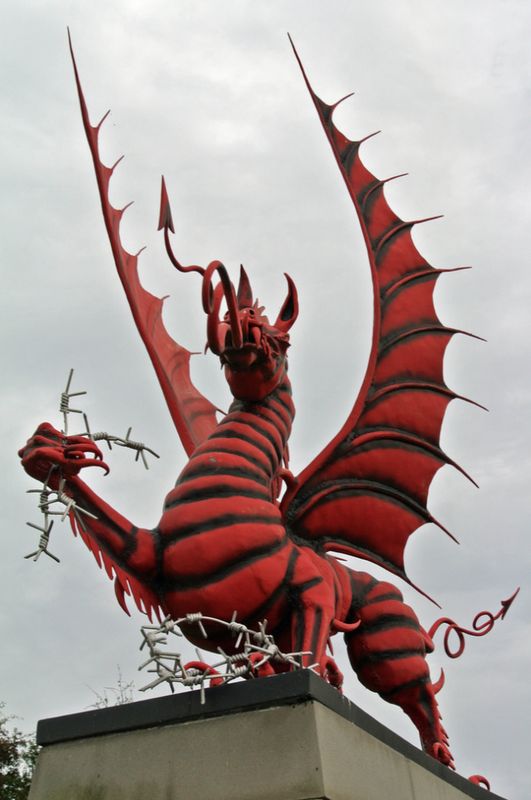 The Welsh dragon on the First World War memorial to the men of the 38th (Welsh) division at Mametz Wood. Today is St David’s Day, the national day of Wales, and it seems an appropriate moment to post what remains perhaps my very favourite story among all the thousands of strange tales that I have read. That is a large claim – I tend to read a fair bit – but I still find what follows so surreal and so magical, in its combination of the gentle, the mundane and the extraordinary, that for me each reading is like immersing myself in a warm bath. All right, it’s pretty hard to credit that it’s literally ‘true’; it helps that it’s a Welsh story, and that I’m a proud Welshman – and that the tale remains all but unknown; the account first appeared in print in 1928, and so far as I can tell has never made it onto the Internet. The names of the characters involved are so common that it would be extremely difficult to check if they were actually real or not; Radnor Forest, though, is real – and is, according to local legend, the place where the last Welsh dragon still lies sleeping (Daniel Parry-Jones, A Country Parson. London: Batsford, 1975). The strange stamps you’re about to read of did exist. No other comment is possible – but then perhaps none is necessary. Here, then, is the story as I first read it – it is based, as mentioned in the first lines, on an article originally published in the 1920s in a children’s stamp magazine [The Stamp Lover, 1928 p.274] The best thing to do is simply to sit back and enjoy. A curious article, ‘The Red Dragon Stamps’ by C.H.R. Andrews, appeared in a journal called The Stamp Lover. Apparently, collectors had been mystified over the previous months by the appearance of certain small denomination British stamps overprinted with a red dragon. Some 20 letters and postcards were known to exist, all having pairs of stamps, the left one of which bore the overprint. Invariably, both were cancelled, although only the normal one could pay postage. At the time of writing, none had been reported for nearly two months. The first of these stamps was reported shortly after the disappearance of Rhys Evans, 71, a well-known Welsh book collector and expert. Evans left home in Sketty, Swansea, on the afternoon of 4 April 1928 to show his friend, Professor Jenkins of University College, a very old Welsh book of stories and legends, which he carried in a waterproof wrapper. It included an account of a secret sect or clan responsible for the guardianship of five sacred dragons, and a crude plan which Evans hoped his friend would decypher. Evans never reached the college, a short walk away. 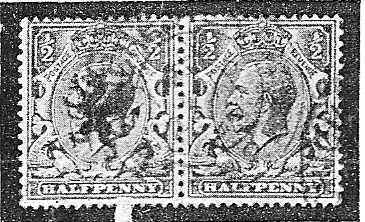 Two days later, his wife received a letter from Cardiff, bearing a pair of penny ha’penny stamps, one of which had the dragon overprint. The message, in Welsh, told her not to worry, as her husband was quite well, and it bore what was undoubtedly his signature. The note ended with the words Trigolion y Ddraig Goch, ‘Natives of the Red Dragon’. Various people subsequently received letters from the group, all bearing dragon stamps and all referring to old Welsh articles. The postmarks were from Cardiff, Cardigan, Wrexham and various towns on the sites of old Roman camps. Evans turned up five days later, sitting by a lake in Brynmill Park. He was in good health, and would give no explanation of his absence. The ancient book was missing, and he seemed unconcerned about its loss, which was quite out of character. He stated enigmatically that “there were dragons in Wales today,” but refused to elaborate. Coincidentally, a report from Llandegley, near Radnor Forest, stated that three children saw a huge beast in the woods, and that one, bolder than the rest, attempted to follow it. His way was blocked by two men who escorted him part of the way home. They were dressed in white with red dragons emblazoned on their chests. Perhaps that’s just as well. That’s such a weirdly charming story that it seems almost a shame to try and verify it. A pleasing bit of old country jiggery-pokery. …and that was all? I though there was more to it …. One can only dream this is true. It probably isn’t, but….! Curious: is there any more information about ‘Natives of the Red Dragon’? Could there be a cultish parallel of these seven churches which are broadly located around Radnor Forest, to the seven churches mentioned in the book of Revelations? Ah, secret societies! Gotta love ’em. Always good for intrigue! I love my red dragon and any stories about it. Thanks. William of Occam, common sense, and reason aside, I’ve decided to believe this, just because it’s so tremendously cool! taken the trouble to send me these details and will now endeavour to find the book. This is a very late reply because I’ve only just noticed this remarkable post about a very obscure story, but I was struck by certain similarities with Thomas Pynchon’s 1966 novel “The Crying Of Lot 49”. The notoriously reclusive Pynchon tends not to say much about his sources, but although he was born in 1937, I wonder if he read an old copy of this magazine at some point? For those unfamiliar with the book, it involves the alleged existence of a secret underground postal service operating in America and used for subversive purposes by radicals, which may or may not be part of a vast centuries-old worldwide conspiracy, the aims of which, assuming it exists at all, are never made clear. Throughout the novel, the dividing lines between reality, fakery, and paranoia are playfully blurred to the point where the protagonist has an epiphany where she momentarily realizes that she’s a fictional character. A philatelist is a major supporting character, and much of the plot revolves around the discovery of US postage stamps similar to ordinary ones but with subtle differences, notably a strange quasi-heraldic device included in the design, which members of this organization supposedly use as an identifying sign on mail relating to the society’s activities. The major plot-point referred to in the book’s title is the possibility that the conspiracy may inadvertently reveal itself by purchasing at any cost a set of these rare stamps, which are assumed by stamp-collectors to be misprints rather than evidence of anything sinister, in order to cover up the fact that it exists. And finally, this secret society is called “Tristero”, which could be a subtle nod to “Trigolion y Ddraid Goch”, and its motto is “We Await Silent Tristero’s Empire”, so I suppose you could call it a “sleeping dragon”. Of course, it may all be a coincidence. However, a very old, very secretive, and quite possibly very made-up cabal which gives itself away by using weird variants of standard postage stamps is a pretty specific plot device! Offhand, I can’t think of any other novels which focus to this extent on philately, or indeed any that prominently involve postage stamps at all, other than a few crime thrillers in which a rare stamp is the Macguffin just because it’s valuable. So what do you reckon? Could this utterly obscure and almost certainly tongue-in-cheek article have inspired a cult classic officially decreed by Time Magazine to be one of the 100 greatest English language novels written between 1923 and 2005? Given the incredible obscurity of the story – is it credible that Pynchon spent his time acquiring and reading long-ago runs of British children’s stamp magazines – you’d have to say ‘No’. But the coincidental detail that you cite is certainly intriguing, and if any American author is capable of that sort of odd behaviour, it’d be him.